When the need for a new roof arises, homeowners have many options and styles from which to choose. Those unfamiliar with residential roof systems can be quickly overwhelmed with the numerous materials that are available. 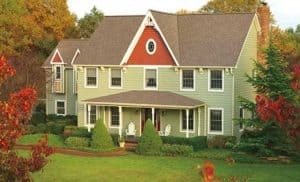 The information contained in this article will help readers understand the form and functionality of one of the most popular residential roofing materials in North America — asphalt shingle roofing. There are multiple reasons for its popularity, including aesthetics, product performance, ease of installation and value. How do I pick the right asphalt roofing system for my home? The first recommendation is to follow the advice of an experienced contractor. Most professional contractors are accredited by shingle manufacturers and can guide you through the roofing process. This article will provide you with the basic information needed to have an intelligent conversation with contractors. It is important that homeowners understand the elements of their asphalt shingle roofing systems. Fiberglass mat: The backbone of the shingle, this high-strength reinforcing material offers the ideal qualities needed for handling and durability. Asphalt: The primary purpose of asphalt is to serve as a water-shedding agent, and to hold the granules in place. It makes up a significant part of the shingle’s composition. Fillers (or mineral stabilizers): These finely-ground materials are added to the asphalt during the manufacturing process to help increase the asphalt’s resistance to fire, and can improve weathering, flexibility and durability. Granules: These ceramic-coated, crushed rock particles coat the ‘face’ of the shingle. Granules are what provide the coloring to shingles, and they also protect the shingle’s asphalt from degradation that would occur from prolonged exposure to UV light. Back surfacing: This is a fine mineral material that is applied to the back of the shingle. Back surfacing allows shingles to be manufactured and stored with fewer sticking to the machinery or to each other. 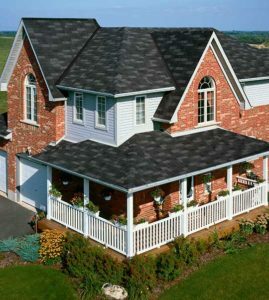 Premium/designer shingles – This offering typically has a high-end aesthetic in either shape and/or color options. Many of these products mimic the appearance of shake, tile or slate. In addition to offering top-of-the-line aesthetics, this category can also contain shingles that have increased performance characteristics, like impact resistance. 3-Tab shingles – This is the basic type of asphalt shingle. It is composed of a single layer with cut-outs forming 3 individual tabs. The 3-tab asphalt shingle is the least expensive asphalt shingle product, common to new construction. 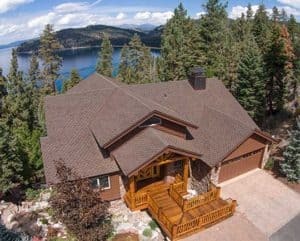 This home’s designer asphalt shingles mimic the look of wood shingles while providing fire-resistance. While the appearance of a shingle is important, there are other properties which must be taken into consideration when planning to have your roof replaced. All asphalt shingles are wind resistant; however, there are different levels of wind resistance. Proper nailing, fastener pull-through resistance and strong sealant bond strength provide wind resistance. Asphalt shingles are tested to determine their wind resistance. Two test standards are commonly used. ASTM D3161, “Standard Test Method for Wind Resistance of Asphalt Shingles (Fan Induced Method).”Class F is the highest rating. ASTM D7158, “Standard Test Method for Wind Resistance of Asphalt Shingles (Uplift Force/Uplift Resistance Method).” Class H is the highest rating. Algae does not damage asphalt shingles, but may affect the appearance of an asphalt shingle roof. Different treatment methods are used to prevent algae growth and the subsequent discoloration that can occur on the roof. Many manufacturers offer AR (Algae Resistant) shingles, which have a special copper composition in their granules, as copper is proven to help control algae growth. Solar-reflective shingles make use of special granules that reflect some of the sun’s energy, helping to keep roof temperatures cooler. This can reduce energy consumption when using air conditioning, especially in hot climates. Residential property owners may also be eligible to receive tax credits, depending on the city or state, for installing solar reflective roofing. The Cool Roof Rating Council (CRRC) manages a system for independently determining solar reflective properties of roofing products. Solar reflectance, thermal emittance and solar reflective index values for CRRC-verified products can be found at coolroofs.org. Solar-reflective shingles can reduce energy consumption by reflecting some of the sun’s energy and keeping homes cooler. Starter strip products: the first row of specially sized shingles, applied at the eaves, needed to help prevent shingle blow-offs. Hip and ridge products: shingles designed specifically to cap the hips and ridges on a roof. Ventilation: proper ventilation (consisting of balanced intake and exhaust) helps extend the service life of an asphalt shingle roof by reducing the attic temperature (ventilation exhausts warm air) and removing condensation in your attic space. Using proper ventilation and meeting Department of Energy recommendations for attic insulation can help reduce ice dam build ups. Underlayment: sheets of water-resistant material that provide a secondary protection from water intrusion. Underlayment is installed between the roof deck and the shingles. Many underlayments are slip resistant to provide safer working conditions for roofers. Ice and water barriers: self-adhered underlayment that helps prevent leaks from wind-driven rain and ice dams in vulnerable areas, such as eaves, valleys and flashings. A roof system consisting of the items listed above is highly recommended for increased performance and longevity. Roof system functionality should be discussed in detail with your contractor. This article is intended to be an informational resource when you are considering replacing your roof. 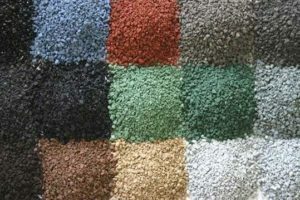 More information can be found on the Asphalt Roofing Manufacturers Association (ARMA) website at www.asphaltroofing.org.